Grotesque. Violent. Terrifying. Misunderstood. Sympathetic. These are some words people use to describe monsters, depending on who you are asking and what the monster is. People’s perception of monsters and their existence is ever changing. Monsters often take the shape of the times, evolving to show the current fears and terrors of the world they come to life in. Frankenstein’s monster is much different than the slashers of modern age. The werewolf from an American Werewolf in London may share similarities with the teenagers of Ginger Snaps, but their raison d’être is quite different. Stephen T. Asma, in his book On Monsters, describes monsters as “extraordinary beings”. Monsters encompass everything from phobias, to societal woes. They are both unimaginable and plausible. They encompass both the inhuman and human. Monsters are both literal and symbolic. The idea of a monster goes from one pole to the other, captivating and horrifying us. Society holds a very love-hate relationship with monsters and their attractive natures. This duality of monsters, their appeal on a physical, psychological, cultural, and emotional level speaks to people. Monsters are seen across ages, across time, across the globe. However, the meaning of monsters for people are as varied as the monsters themselves. Even the same monster can mean different things to different people, all based on cultural and personal factors. For some people, monsters hold a deep connection to their very identity and how they see themselves and the world. Identity is something that is occasionally seen as monstrous. Those who identify outside of societal norms may be seen as monstrous, even if they are causing others no harm. They are treated like monsters, shunned, harassed, and even killed much like the monsters in the movies or stories. For example, there is a vein of identification with monsters in the trans community. While a subset, this is a common thread enough that it can be explored with numerous conclusions and explanations. For some trans people, monsters represent the way society sees them. It is a reclamation of a title given to their existence, forced on them for being who they are. For others, they represent the factors of their bodies and the conflict they experience. They may also represent the escape, the strength, needed to deal with a society that views you as other, grotesque, terrifying, horrific. “The werewolves in the movie are often the target of hate and loathing, even within their human forms. This makes social acceptance for them a losing battle. In the past, I had been a continuous target for slurs, harassment and even physical threats. And just like the villagers that would chase and hunts the wolves, tracking them down no matter how hard they flee, it revealed that the self-righteous and “normal” individuals could be even more monstrous than a werewolf.” -Jenny, on her connection with werewolves. Monsters represent how society sees trans people for some. This reflection of their own experiences of violence, rejection, and exclusion creates an empathetic tie to monsters. For some it is specific, like with werewolves (a very common response). For others, it is simply an analogy for the pain of living in a society that treats you in the same way. Rex, as well as Van, both mentioned feeling out of place in their lives as part of their monstrous identity. “Maybe it’s trite, but for a long time I simply do not feel at home in my body, my location, my life.” Rex told me. Van mentioned something similar, the monster as a “symbol of one’s own not-belonging”. “After realizing I was transgender, a lot of this clicked into place. It wasn’t that I wasn’t human, or that there was something wrong with me, it was just that I had been being forced to act like someone I wasn’t. And it had hurt me deeply. My built up resentment had been towards those that could live as their assigned gender, while I struggled with my identity.” Meatmaiden, who during his struggling years before realizing they were transgender, explained his connection with vampires. Vampires, for him, “hated their inhuman bodies. I also hated my body”. Vampires and their plight of being ‘stuck’ resonated with him and his situation at the time. Jenny, whose monster of identification is werewolves, explained why she sees herself in these monsters. “The titanic proportion of my body and the hair that I continually fight back terrify me, and makes me the target of many suspicious onlookers. And just like werewolves, I have no control over what my body does. Feeling like a prisoner to how your body changes is a special torment I think a lot of transgender people share with werewolves.” For Jenny, werewolves reflect her existence as a trans woman. Not just from the hairy aspect either. “Underneath the fur and ghastly exterior is a human being who’s just as terrified as the villagers in the movie, and I can’t help but feel like we experience a similar pain”. Image of Francine, used with permission. For Van, the film The Creature and its monster, held a special connection. “Even [before I] realized I was queer, I loved and related intensely to the Creature. In the film, the Creature is hunted, captured, held against his will, is violent and beastly, but also shows an interest and tenderness towards the leading lady. I felt very much like he was misunderstood and lonely.” The monster in this movie showed the tenderness that a human feels yet was misunderstood due to its appearance and lot in life. This monster, represented Van’s feelings towards their developing queerness and the contrast with how they felt in their school and environment. Not all identification is negative (and not to say it was/is entirely negative for the above). For others, monsters come with power. This power comes not only from their monstrous nature, but also from being able to identify with the situations a monster may find themselves in. Seeing the power of monsters in these situations allows for some to draw on this power for their own needs. For Rex, “Monsters have come to represent to me a hope for something different, and perhaps something that I feel more comfortable doing and being”. For them, monsters represent possibilities outside of the binary. In a similar vein, Pete explains their connection with monsters and the monstrous. “Monsters are strong and powerful, and realizing that I can form my own gender identity is one way that I’m strong, too.” Monsters are a source of strength for them, and by being connected with what a monster is, allows for them to explore their own sense of identity. “It’s not just my gender that interfaces with monstrosity, but it’s a key point of connection. Because of the disconnect with the shape I am in other people’s minds and the shape I am in my own, because of the constant pressure against the spikes in the void, because of prejudice and fear and suppressed rage, because of the fact that there’s no space for my gender in the reality I’m tangled in like Fenrir in Gleipnir.” –Kestor, describing zir monstrous identity. “Let me tell you though, ‘gay vampire is lost at Costco’ is a fun look and worth a try if you are a trans goth who wants to expand your horizons.” –Margo, on their monstrousness. In the same light as Francine, Kestor sees zir monster connections as an inherent part of zirself. “I am not a shapeshifter, but if my soul had its way, I would be. My spine grows spikes, I curl my fingers into claws, I twist my shoulders like I’m raising my hackles, my back itches where the wings would be, and when no-one’s looking I scream and snarl. Silently.” The nature of monsters and their very different physical forms appeal to some, showing the power in the strange and the othering. Monsters are not to be feared but respected in a sense, something that demands attention and awe. Even in concept monsters are a powerful force. As previously mentioned in this piece, monsters represent many facets of existence on this plane and others. Monsters come from all walks of life, from our world and the extraterrestrial. They are physical as well as spiritual. This allows for monsters to occupy various spaces within our minds and hearts, their existence changing to challenge as well as to create. They are both creation and destruction, humanity and the inhuman. This sliding scale of existence allows for monsters to be able to fill niches that other representations cannot. In the nature of creation, some monsters do not take physical or metaphysical/spiritual forms. They are something innate that works their ways into a life one way or another. Shell has created her own self-representation through monsters. In her games, she noticed the reoccurring character Anosphia. This mosquito-like woman was a representation of Shell herself and the various aspects of her life and journey as a trans woman, both positive and negative. Anosphia evolved over the course of several years, changing as Shell’s life did. Her representation in her own works was that of a monster. Pictures of Anosphia (with permission from Shell Osborne). “Thinking of werewolves was a great outlet. Their bodies change but on a schedule; they’re animals and don’t have to follow the social niceties expected of humans; they aren’t going to get bullied; to be honest, if you see a werewolf you’re probably not going to ask if it’s a boy or a girl….” –Pete, on their association with werewolves. For some in the trans community, monsters represent the lack of representation seen on TV. They may also encompass the daily trials that being trans in an unaccepting world brings. As their existence is extremely varied, monsters and their infinite difference can represent an infinite number of possibilities to people. Monsters are compelling, beautiful, alien, unique, liberating, strong, powerful, cool, ghastly, and so many other adjectives. Monsters represent the differences among humans possibly better than humans do themselves. They are exciting, otherworldly. They are respected, feared. Monsters represent a full spectrum of emotions and existences, both real and unreal. For some of us though, monsters hold a special place in how we view the world that is just as varied as the monsters themselves. 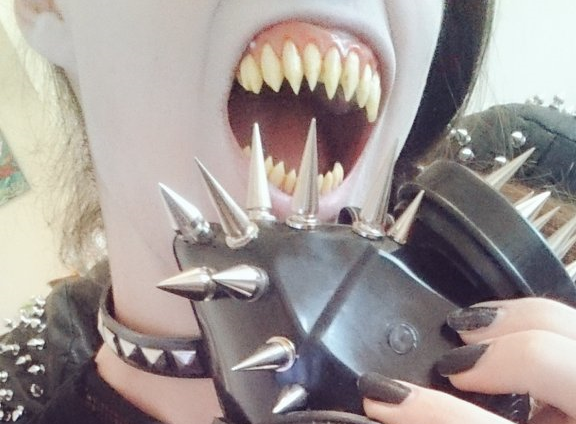 Support Lucian and other GenderTerror creators by becoming a part of our Patreon! Every dollar counts. taking up this task will remake you in the process.